Yamaha Club releases its first DVD in hopefully a series. Getting Started: Exploring Music Finder contains around an hours worth of informative viewing showing you how to get the very best from your instrument using a feature that lies at its very heart – Music Finder. With James Woodcock behind the camera, Glyn Madden provides expert knowledge with simple explanations aided by on screen explanations for the viewer. Yamaha PSR-1000, PSR-1100, PSR-1500, PSR-2000, PSR-2100, PSR-3000, PSR-S700/S710/S750, PSR-S900/S910/S950, Tyros (1), Tyros 2, Tyros 3, Tyros 4, Tyros 5, CVP200, CVP300, CVP400 and CVP500 Series Clavinovas. UK PAL Format however Region Free! Yamaha PSR-1000, PSR-1100, PSR-1500, PSR-2000, PSR-2100, PSR-3000, PSR-S700/S710, PSR-S900/S910, Tyros (1), Tyros2, Tyros3, Tyros4, CVP200, CVP300, CVP400 and CVP500 Series Clavinovas. UK PAL Format however Region Free! Basic sequencing is something that can be achieved and enjoyed by everyone. Open the door to Yamaha’s ‘Song Creator’ – and unlock your potential to create professional sounding recordings and backing tracks. In ‘Building A Performance’ popular UK demonstrator Richard Bower illustrates how, by making small changes in the way you approach a new piece of music, you can transform a basic tune into a performance. Richard’s years of experience shine through in this workshop which is packed with good ideas and common sense advice. Yamaha artist Glyn Madden answers some of the most frequently asked questions in a treasury of hints and tips from the Yamaha Club’s archive – presented as a series of easy to follow mini-workshops and step-by-step demonstrations. A second helping of easy to follow mini-workshops and step-by-step demonstrations from the Yamaha Club archive. Glyn Madden and James Woodcock present a further selection of hints and tips as they answer some of the Yamaha player’s most frequently asked questions..
‘Masterclass! is the seventh title in our ‘Playing Yamaha’ series and, building on the success of the Easy Keyboard Library workshop series (featured in the Yamaha Club Magazine), the DVD sets out to show you how, with a few common sense ideas (and a bit of practice), you can turn a fairly simple lead-line and chord symbol music score into a professional sounding arrangement. 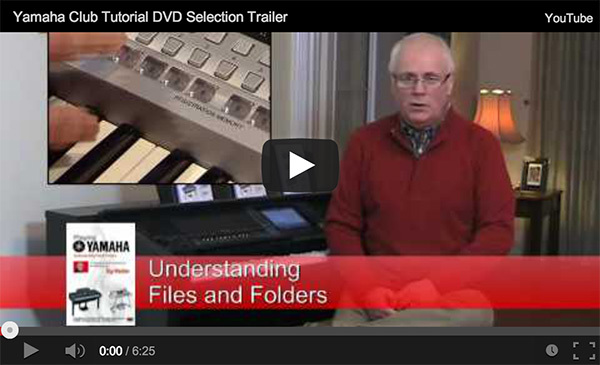 The DVD features lots of music – and lots of tips to pick up along the way. You’ll be surprised how a small change to the way you arrange and play your keyboard’s voices and styles can make a huge difference to the way it sounds.